I know that it seems like every winter our house seems to get very dry, and that can lead to added coughing, a sore throat, and feeling uncomfortable when you have a cold. We've always had a humidifier in our house for those times we need a little added moisture. Since we heat our house with a wood stove in the winter it seems those times are more often that most. Before we just had one that we moved around the house depending on where it was needed most. But now that we have a fun Olaf humidifier we have two to go around and cover more rooms. Of course it seems like my daughter is the one that has ended up claiming Olaf as hers and has him in her bedroom. 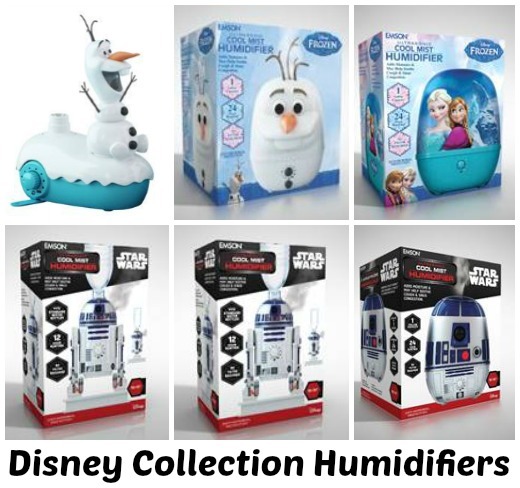 Disney humidifiers can add moisture to any room. They fight mold and mildew, feature anti-microbial technology, on/off dial (min/max settings) and a mist nozzle. Frozen Olaf is such a great humidifier! The design is cute and it is well made and easy to use! My niece loves it.. This is great for kid's rooms. Exactly like I imagined it would look like. My kids are gonna love these Frozen Humidifiers! Thanks for the info,I will buy one for my home. The appearance of the Olaf humidifier is very cute, and every child will like it.